Three college students seeking to make a documentary about local bear killings embark on a mission to follow a person they believe to be hunting and killing bears. The further they follow the hunter however the more they realize bears are not what he is hunting. 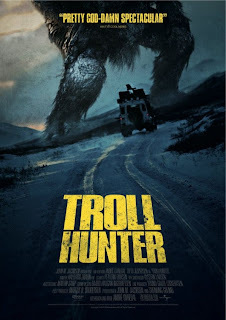 "Trollhunter" is another found footage film in the vein of "The Blair Witch Project," "Cloverfield" or "[Rec. ]," presenting material that has allegedly been found and is unaltered in any way. Going into the movie my skepticism was pretty high. It is a genre of film making that while has plenty of room for advancement, the gimmick or approach is already wearing itself thin. That said, there still was curiosity in the Norwegian made adventure. I mean the title alone implies we are talking about hunting trolls. Not the vile creatures that have nothing better to do then frustrate you in various forms of online social media but the fairytale type troll who we read about as children in the Grimm fairytale stories. The risk factor for me with found footage films is not the creature or the mystery, but instead it lies in the human connection. Are the characters we are following in the found footage going to be engaging and connectible? Are they going to be sniveling brats or completely mundane and boring? Sadly, "Trollhunter" is a mixture of good and bad. One character works extremely well while the college students are nothing short of tedious. The one character that works is the Trollhunter (Trolljegeren) played by Otto Jespersen. Jespersen comes across mysterious from the onset. Credit to both the filmmaker André Øvredal and Jespersen you immediately want to know more about the hunter and what exactly is he hunting. Jespersen draws you in with his demeanor and control on camera. He is like a war hero that has thousands of stories you'll want to continuously listen to, difference is his stories are about hunting trolls. On the other hand the college students documenting him, are a disappointment. There is zero engagement in who they are yet miles of interest in what they are filming. As for what the college students are filming, I loved it. 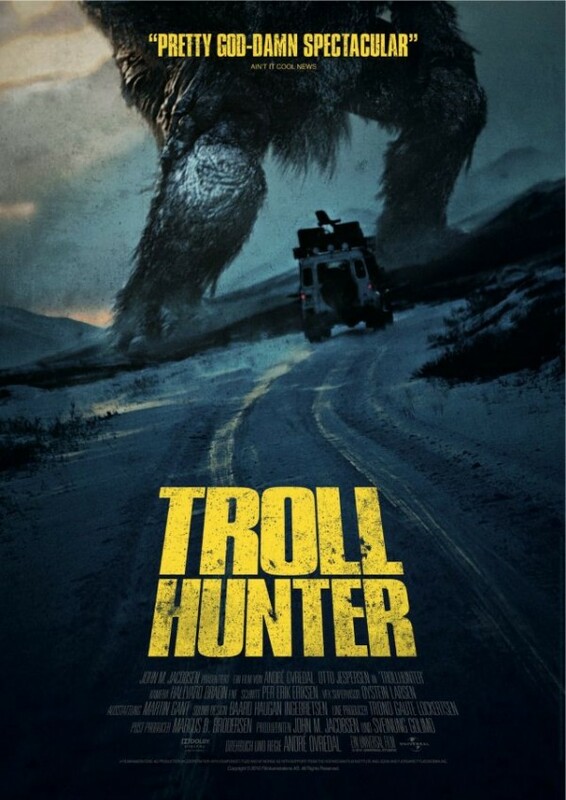 "Trollhunter" does not disappoint in the category of trolls. We get an ample amount of thrill and discovery along the way as well as a number of scares. Every troll encounter is tense, full of energy and memorable. There is a great build up that carries on throughout the film with each prospective troll being more nasty than the last. This helps to keep the audience compelled but also "oh and awing" at the sight of the ancient creatures as the film presses on. We also get a fair share of background on the trolls by our Trollhunter. I found this aspect of the film fabulous. As the footage moves forward we get snippets of lore about each of the trolls they are hunting ultimately helping to flesh out the story and fantasy. A disadvantage with any found footage film is we are at the mercy of the camera operators and while much of "Trollhunter" is steady there is a whole lot of shaky cam in poorly lit areas. One scene in particular stands out very earlier on in the film. The college students are following the Trollhunter and have yet to realize the true nature of what he is hunting. When they do, it is an all out retreat in the opposite direction. A sequence that while necessary reminds me why the found footage films can be hard to sit through. We are subjected to a camera bouncing around and around for close to 30 seconds. Again, the sequence makes total sense (who wouldn't run when being chased by a twenty foot troll), but the strain of having to be subjected to the shaky camera work simply becomes an annoyance. "Trollhunter" is a prime example of things I like in a movie outweighing the numerous things I dislike making for an enjoyable experience. It is a thrilling fantasy that is fueled on escapism and scrambled with realism. Much of the realism stumbles only bogging down the adventure but the fantasy thrives raising the film from just being another found footage film to one worth recommending. For every kid (or adult) whose ever wondered if mythical creatures exist in the world, "Trollhunter" is a fun and stirring ride that is made to push all the right buttons.